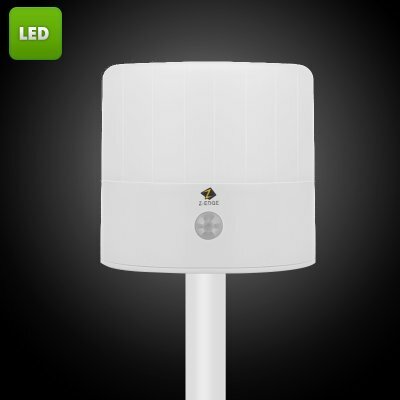 Successfully Added Z-Edge LED Lamp - 43 Lumen, IP54, PIR Sensor, 3 Modes to your Shopping Cart. Super bright indoor & outdoor lighting at a fantastic price, for BBQ, camping, parties, backup lighting and home security. With its unique design the versatile Z-Edge light can be used in almost any situation, indoors or out. A flat base lets it be placed on a flat surface where it delivers around 43 lumens of illumination. With a built in hook in the base let you hang the lamp in an closet or cabinet so you can have a convenient and easy to use light without where you want it that won't require any wires. An IP54 rating means the Z-edge can be used outdoors to bring you outdoor lighting once the sun goes down. This makes it a fantastic way to light up parties, BBQ's or illuminate campgrounds. This wireless LED Lamp runs on 3 type C batteries and delivers days of lighting without the need for any cables so you can benefit from its portability. With an estimated battery life of 110 hours of continuous lighting the Z-Edge makes a great backup light that won't let you down in a power cut. Precision light sensors with high sensitivity, a 110 degree detection angle and 26 foot range provide automated light control. Just hang the Z-Edge in your back yard or place it in the lawn with its ground stake for great automated outdoor lighting. No more tripping over at night when walking up the garden path and bring added security to deterring intruders as with the z-Edge in place they won't be able to approach unnoticed. The Z-Edge LED lamp comes with a 12 months warranty. Brought to you by the leader in electronic devices as well as wholesale LED lights..